In September 2015, the Brandeis Post Baccalaureate Program in Studio Art moved to a newly renovated on-campus location in the Epstein Building, situated right at the Roberts-Brandeis commuter rail stop. It is close to the Rose Art Museum, campus lectures, screenings and concerts. Epstein has 13 private studios with various configurations of windows, skylights and track lighting. The building has two critique spaces, a woodshop, a computer lab and simple kitchen facilities. Students also have access to the nearby undergraduate studio building, Goldman Schwartz. 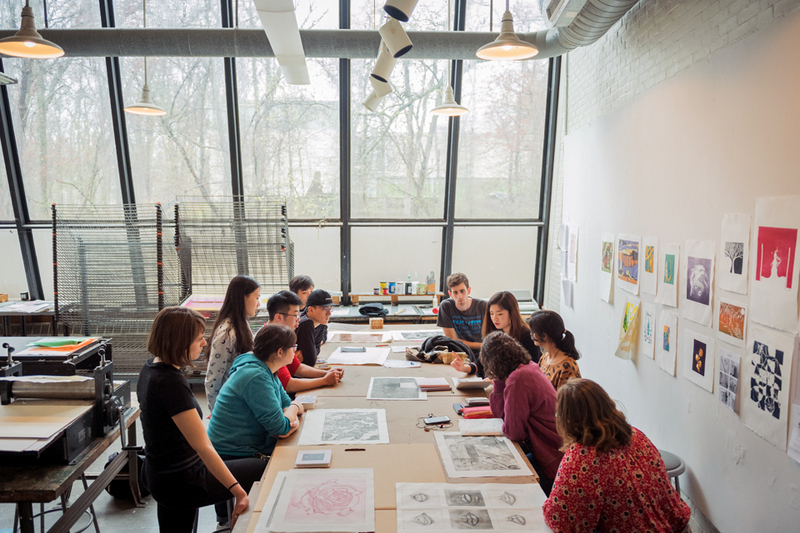 Classes in Printmaking and New Media are taught in Goldman Schwartz that houses a media lab, printmaking studio, and fully equipped sculpture facility. Every student who enrolls in the program has a large private studio within Epstein. Students also have access to communal storage rooms equipped with racks for large and small work. The post-bacc studio spaces are available to students 24-hours-a-day. It is a locked and secure space. All post-baccalaureate students have access to the sculpture facilities in both Epstein and Goldman-Schwartz. The shop in Epstein has a woodworking area. The studios in Goldman Schwartz can be used for woodworking, welding and plaster and clay. The printmaking studio in Goldman Schwartz currently has presses and materials for intaglio, relief printing, lithography and silkscreen. Students enrolled in certain fine arts courses use a computer lab in Goldman-Schwartz fully equipped with Mac computers, scanners, and printers. If you have questions, please contact Ariel Freiberg or Christine Kahn.